Gratefully acknowledging God’s guidance and the bountiful blessings that has been showered on us during yet another school year, I take great pleasure in presenting the annual report for the year 2016 – 2017. My heart overflows with gratitude to God Almighty for guiding every step that I took through this year. 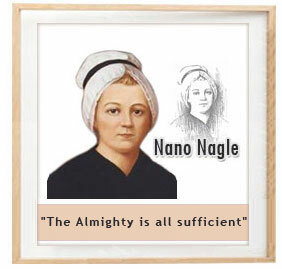 In the spirit of Jesus and our foundress, Venerable Nano Nagle, the task of our school today is to help the students to discover the light within themselves and share it with others, to make them God – centered and person –centered to enable them to be responsible citizens in the world of our times and play their unique role in the transformation of society. I thank my community of Sisters in Perambur who have been a great support in motivating me to continue Nano’s mission entrusted to me. At St Joseph we continue to inculcate in our students love for the materially poor, to foster critical thinking and promote Christian and moral values. Our education strives to bring about social change, which is much needed in today’s world. The contribution of the parents, teachers and students is considered to be of absolute importance in the harmonious growth of the school community. The academic year began on 1st June 2016. Our school corridor buzzed with excitement as the staff and students greeted each other with a special assembly. In the Higher Secondary Examination, our students proved their scholarly excellence with a centum result. 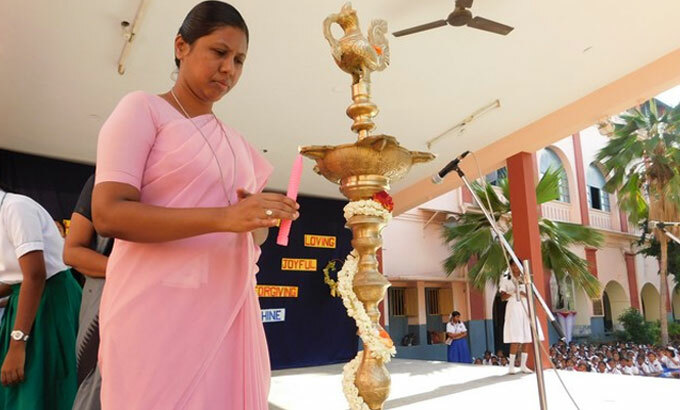 Nancy H. topped the class with a total of 1152 out of 1200 with (French) as 2nd language and Christina Jenifer M., Secured 1148 out of 1200 with Tamil as 2nd language. Maria Anita J. secured centum in Business Maths. Four students excelled in French scoring 199 out of 200. In the SSLC Examination we secured 99%. Nirthiga K.S. topped the list with 487out of 500 and Shivani H. secured the second place with 484 out of 500. Our students excelled in the Board Examination securing 2 centums in Maths, 6 centums in Science and 15 centums in Social Science. Congratulations dear students. The Investiture Ceremony was held on 18th June 2016 with Sr. Jeyarani as the Chief Guest; Sister motivated our newly - vested Captains with a message and exhorted them to carry out their responsibilities to the best of their ability. On the 4th July we had the blessing of the newly constructed bridge connecting the St. Joseph Block & Nagle Block of our school. Rev. Fr. Joe Andrew, Parish Priest of Our Lady of Lourdes Shrine, Perambur, blessed and inaugurated it. The role of physical activity in the development of children can hardly be over-emphasized in the world today. 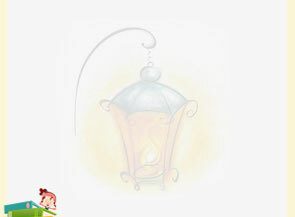 Games and Sports are essential for the all – round development of our personality. We would like to place on record the achievements of a few of our trending sports stars. Junior Nationals – In the under 18 category Ishwarya J. and Nishanthi M. of Std. XII were part of the Tamilnadu team. They secured the II place and were awarded a cash prize of Rupees one lakh each. Nishanthi M. of Std. XII participated in the Basketball match conducted by the Federation of International Basket Ball Association, held at Thailand from the 13th to the 20th of November. Catherine Sylvia Mary C. of Std. XII represented Tamil Nadu in the Youth Rural Federation Cup held at Goa from 22nd to 26th October. The Tamilnadu team secured the II place. Deepika K of Std. VIII was selected to represent the Tamilnadu team for the sub – junior Basketball Nationals held at Hyderabad and the team secured the second place. Our school Basketball Super Senior team participated in the State Level Bharathiyar Day Sports and Games held from 27th to 30th December in Trichy. They won the second place and were awarded a cash prize of Rs. 800 each. The Nano-Nagle Basket – Ball Tournament 2016 was successfully conducted by our school on 21st August. Our school secured the 1st place for Juniors in the under 14 category, the II place was secured by HLC Hr. Sec. School, Tambaram. Under the open category Std. IX to XII, our team secured the First place and the Second place was secured by NSN Hr. Sec. School. In Table Tennis, Gladlyn Flora of Std. XI participated in SGFI Nationals held at Delhi from 2nd to 8th January. She secured the III place and was awarded a Bronze medal. Christy Joshey and Gladlyn Flora participated in the State Level Table Tennis Doubles. Our Super Senior Kho – Kho team won the II place at the District Level. Prajeetha L.R. of std. IV participated in the National Level Chess Tournament held at Punjab in August 2016. Novina Bertina Mary J.V. of Std. XII attended the SGFI selection at Cuddalore and secured the fourth place. Our school students participated in the A.I. meet held at Yercaud, on the 2nd and 3rd of September. Hemah S. of Std. IX secured the II place in High Jump and Varsha Priyadharshini S. of Std. IX obtained the III place in High Jump. In Karate, Jashwini S.A. of Std. VA participated in the 4th All India Open Karate Championship Tournament held on 6th November at Vijayawada, Andhra Pradesh. She secured the first place in Kata and second place in Kumite. The Tamilnadu Youth Association in Mylapore, conducted an elocution competition. The topic was “God’s mercy and our response as a messenger”. Preena Evangeline J. of Std. VIII participated and secured the III place. The First Friday Mass of every month impresses on our students the need to recognize the presence of God in our lives. Retreats have been organized for our students from classes VI to XII. The sacrament of reconciliation is given to the students regularly. We are thankful to the Parish Priest of Our Lady of Lourdes Shrine – Perambur, who take great interest in celebrating the Eucharistic. The church celebrated the year of Mercy and we, as a school instilled in the children the need to love, share and care for the less fortunate. The Management is appreciative of the Parents’ involvement and generous support. We had the privilege of interacting with Sr. Francis Murphy, one of the General Councellors of our Congregation from Ireland who came on an official visit. Sr. Josephine Murphy and Sr. Helen Burke of Ireland were also warmly welcomed with a cultural display of tradition and colour. Our main thrust is towards the materially poor. Our education brings about social change.